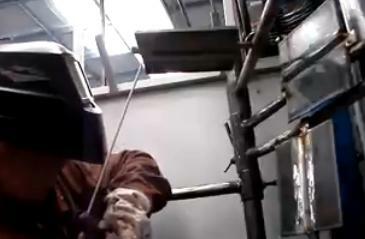 In this video a guy is practicing an overhead weld test plate welding test. He has a 2G horizontal, a 3G vertical, and a 4G overhead plate test all set up ready to weld. Structural welding that is done to AWS D1.1 structural welding code usually requires a groove weld test that uses a 22 1/2 degree bevel on the plate with a 1/4 " gap and 1/4" backing bar. When you are in welding school, often times you practice groove weld plate tests with a 30 or even a 37 1/2 degree bevel because the plate tests are often done in preparation for a pipe welding test. 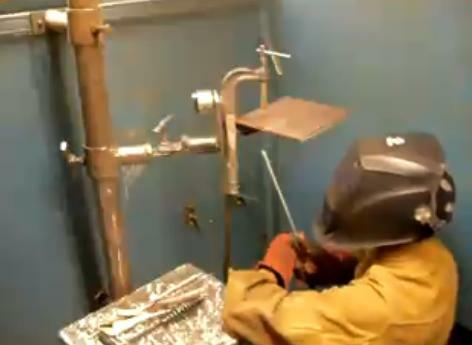 ASME section IX is a frequently used standard for pipe welding tests and pipe tests to that code are often done with the 37 1/2 degree bevel plates. This welding student is welding the 7018 overhead 4G groove weld joint with a backing strap in this video. try to use a dead nuts 90 degree rod angle. and one more tip... try to hold the stinger in such a way so that when (when not if) slag drips, it wont land on your glove fingers because if that happens you will need to decide whether to be tough it out and live with the burns, or stop and have an extra tie in. Most beginners try to turn the amperage down thinking that using low amperage will prevent the weld from dropping down. Thats the wrong plan. For overhead welding , set the amperage like you were welding flat and keep the rod packed in tight and the arc force with help the weld punch in and flatten out. just dont get crazy with the amperage and keep the rod angle at 90 degrees.